The show-cause order served on James Madison was damaged in the Capital fire of 1898. Marbury v. Madison, 5 U.S. (1 Cranch) 137, 2 L. Ed. 60 (1803), established the power of Judicial Review in the U.S. Supreme Court. This power, which was later extended to all federal courts, authorizes the federal judiciary to review laws enacted by Congress and the president and to invalidate those that violate the Constitution. The power of judicial review also permits federal courts to compel government officials to take action in accordance with constitutional principles, as the Supreme Court did when it ordered President richard m. nixon to release tapes he had made of conversations at the White House regarding a series of scandals that began with the Burglary of the Democratic party's national headquarters in the Watergate office complex in June 1972. Finally, judicial review empowers federal courts to decide legal issues raised by state constitutions, statutes, and common-law decisions that touch upon a federal constitutional provision. Judicial review is also routinely exercised by state courts over state and federal constitutional questions. Unlike the federal power of judicial review, which derives from Marbury, the state power of judicial review usually derives from an express provision in a state constitution. Marbury was an outgrowth of political struggles between the Federalist and Republican parties during the late eighteenth and early nineteenth centuries in the United States. These struggles began as a dispute between the Federalists and Anti-Federalists over the ratification of the Constitution. The Federalists, including Alexander Hamilton and John Jay, supported ratification of the Constitution as a means of creating a stronger national government that would replace the feeble central government formed under the Articles of Confederation. The Federalists believed that a strong national government was necessary to promote economic growth and geographic expansion and to protect U.S. citizens from internal and external aggression. The Anti-Federalists, including George Mason and Patrick Henry, opposed ratification because they feared it would create a despotic national government that would vitiate state sovereignty and be unresponsive to local interests. After the Constitution was ratified by the states, many disgruntled Anti-Federalists joined the Republican Party. Like their Anti-Federalist predecessors, the Republicans worked to curtail further growth of the national government, drawing their constituency from farmers and mechanics. The Federalists, meanwhile, sought an increased role for the national government, including the establishment of a federal bank, and drew their constituency from wealthy property owners and mercantilists. During the administration of John Adams (1797–1801), Federalists controlled the executive and legislative branches of the federal government and permeated the federal judiciary as well. However, the political tides turned against the Federalists during the elections of 1800, when the Republicans wrested control of both houses of Congress and Thomas Jefferson, their party leader, was elected president. Determined not to lose all its influence over the national government, the lame-duck Federalist Congress passed legislation that created a host of new federal judgeships and called for the appointment of 42 justices of the peace in the District of Columbia. In the haste of filling these vacancies during the waning hours of his last night in office, President Adams neglected to deliver the commissions (warrants issued by the government authorizing a person to perform certain acts) of several appointees. One of the so-called midnight appointees who did not receive his commission was William Marbury. After Jefferson ordered Secretary of State James Madison to withhold Marbury's commission, Marbury petitioned the Supreme Court for a writ of Mandamus (a court order requiring an official to perform his duties) to compel Madison to deliver the commission. The case was heard before Chief Justice John Marshall and four associate justices. Marshall was one of the "midnight judges" President Adams had appointed to the federal bench during his last few months in office. Prior to his appointment to the Supreme Court, Marshall had served as secretary of state for the Adams administration. Ironically, it was Marshall who, serving in a dual capacity as the secretary of state and chief justice, had failed to deliver the commission to Marbury. None of these facts presented a sufficient conflict of interest for Marshall to disqualify himself from hearing the dispute. Marshall's opinion, written for a unanimous Court, was divided into five parts, the first three being the least controversial. First, the Court held that Marbury had a legal right to serve as Justice of the Peace and was entitled to receive the commission memorializing that right. Marbury had been nominated for the office by the president and confirmed by the Senate, in accordance with the procedures set forth in the Constitution. When President Adams signed the commission and affixed the seal of the United States to it, the appointment was "complet[e]." Delivery of the commission was a mere "convenience" that did not interfere with Marbury's legal right. Second, the Court ruled it was a "plain violation" of this right for Madison to withhold the commission. When a commission has been signed and sealed by the Executive Branch following a nominee's appointment and confirmation, the secretary of state, Marshall said, has a "duty" to "conform to the law" and deliver it as part of his "ministerial" responsibilities. Third, the Marshall opinion said a writ of mandamus was the proper remedy because mandamus is a "command" directing "any person, corporation or inferior court of judicature … to do some particular thing … which appertains to their office and duty." Marshall's opinion next addressed the question of whether the Supreme Court had the power to issue Marbury the writ. This question turned on the Court's jurisdiction. Article III of the U.S. Constitution confers upon the Supreme Court two types of jurisdiction: original and appellate. Original jurisdiction gives courts the power to hear lawsuits from their inception, when a complaint or petition is "originally" filed with the tribunal. Appellate jurisdiction gives courts the power to review decisions that were made by lower courts and have been "appealed" in order to reverse a purported error. Under Article III, the Supreme Court has original jurisdiction over politically sensitive disputes such as those "affecting ambassadors" or those in which one of the 50 states is named as a party. In all other cases, the Supreme Court retains appellate jurisdiction. 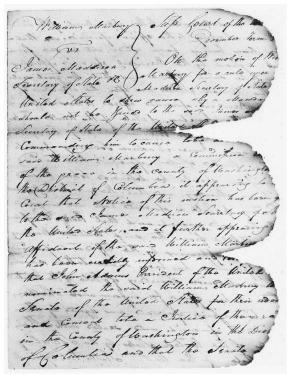 In petitioning the Supreme Court directly for a writ of mandamus, Marbury was asking the Court to invoke its original jurisdiction pursuant to section 13 of the Judiciary Act of 1789, which authorized all federal courts to issue such writs "in cases warranted by the principles and usages of law." Yet Marbury was not an ambassador or state government entitled to have the Supreme Court hear the case under its original jurisdiction. As a consequence, Marshall opined that section 13 impermissibly attempted to enlarge the Supreme Court's original jurisdiction to include disputes such as those presented by Marbury v. Madison, in contravention of the constitutional limitations placed on that jurisdiction by Article III. However, Marshall suggested that merely because a piece of legislation violates a constitutional principle does not necessarily mean that the legislation is unenforceable. "[W]hether an act repugnant to the constitution can become law of the land," Marshall noted, "is a question deeply interesting to the United States." Observing that the Constitution expressly delegates and limits the powers of Congress, Marshall asked, "To what purpose are powers limited, and to what purpose is that limitation committed to writing, if these limits may, at any time, be passed by those intended to be restrained?" It is a proposition too plain to be contested, that the constitution controls any legislative act repugnant to it; or, that the legislature may alter the constitution by an ordinary act…. Between these alternatives there is no middle ground. The constitution is either a superior, paramount law, unchangeable by ordinary means, or it is on a level with ordinary legislative acts, and like other acts, is alterable when the legislature shall please to alter it… . If the former part of the alternative be true, then a legislative act contrary to the constitution is not law: if the latter part be true, then written constitutions are absurd attempts, on the part of the people, to limit a power in its own nature illimitable. For Marshall, the idea that an unconstitutional act of legislature could "bind the courts and oblige them to give it effect" was "an absurdity too gross to be insisted on." Thus, Marshall concluded that congressional legislation contrary to the federal Constitution is null and void and cannot be enforced by a court of law. Having ruled that the Judiciary Act of 1789 was invalid and unenforceable, Marshall next asked whether the judiciary was the appropriate branch to be vested with authority to overturn unconstitutional legislation. Although it is commonly accepted today that the power to nullify state and federal statutes falls within the purview of the judicial branch of government, the Constitution does not specifically delegate this power to any one branch. Under the explicit provisions of the Constitution, then, the executive and legislative branches might have argued in 1803 that they were no less entitled than the judicial branch to be entrusted with the power of judicial review. It is emphatically the province and duty of the judicial department to say what the law is. Those who apply the rule to particular cases must of necessity expound and interpret that rule. If two laws conflict with each other, the courts must decide on the operation of each. So if a law be in opposition to the constitution: if both the law and the constitution apply to a particular case, so that the court must either decide that case conformably to the law, disregarding the constitution; or conformably to the constitution, disregarding the law: the court must determine which of these conflicting rules governs the case. This is of the very essence of judicial duty. Marshall was arguing that it was the historical role of courts to settle legal disputes by interpreting and applying the law. In some instances, the applicable statutory or Common Law has conflicted with other laws, Marshall said, and it has been the obligation of courts to resolve "the operation of each." Earlier in his opinion, the chief justice had described the federal Constitution as a special kind of law that was "paramount" to all other laws in the United States. It then followed, the chief justice reasoned, that courts carried the responsibility to interpret and apply the Constitution's provisions. This responsibility inevitably entailed review of cases where laws passed by the legislative and executive branches conflicted with the strictures of the Constitution. By resolving such conflicts, Marshall maintained, courts were doing nothing more than fulfilling their traditional role of settling legal disputes. Marshall also questioned whether members of the legislative and executive branches could objectively evaluate the constitutionality of legislation they passed. It is sometimes said that a diner, not the cook, is the best judge of a meal. Following the same reasoning, Marshall hinted that the legislative and executive branches could not impartially review legislation that they had helped prepare or enact. It is far from clear, for example, whether the Federalists in Congress who supported the Judiciary Act of 1789 could have put aside their partisan views long enough to exercise the power of judicial review over the Marbury dispute in a fair and neutral manner. Chief Justice Marshall's opinion in Marbury has been the object of much criticism. Constitutional historians claim that Marbury represents a paradigm of judicial activism, which is marked by judges who decide cases based on issues not argued before them. This criticism seems to be particularly apt when applied to Marbury because, as constitutional scholar Leonard W. Levy has pointed out, "[In] no other case in our constitutional history has the Court held unconstitutional an act of Congress whose constitutionality was not at issue." Neither Marbury nor Madison had attacked the constitutionality of the Judiciary Act. Against this criticism, historians have weighed the dilemma confronting Chief Justice Marshall. As a Federalist appointed to the Supreme Court, Marshall attempted to facilitate the growth of the national government through his judicial opinions. To achieve this end, Marshall aspired to establish the Constitution as the supreme law of the land, under which the executive, legislative, and judicial branches of both state and federal governments would be subordinate. He also hoped to establish the Supreme Court as the ultimate arbiter of the Constitution, providing the final word on the meaning and application of any constitutional principles. Marshall realized that none of these aspirations would be realized unless the Supreme Court gained respect and acceptance from Congress and the president. After all, the Supreme Court depended on the executive branch to enforce its decisions. President Andrew Jackson once underscored this point when he exclaimed, "John Marshall has made his decision [in Worcester v. Georgia, 31 U.S. (6 Pet.) 515, 8 L. Ed. 483 (1832)], now let him enforce it!" (as quoted in Coleman v. United States Bureau of Indian Affairs, 715 F.2d 1156 [7th Cir. 1983]). Marshall also needed to curry the favor of Congress, which possessed the power to limit the appellate jurisdiction of the Supreme Court under Article III, Section 2, of the Constitution. In addition, Congress possessed the power to impeach the Supreme Court justices, a power that it unsuccessfully exercised in 1805 when the Senate acquitted Federalist justice Samuel Chase of wrongdoing. Marbury was the powder keg threatening to upset the delicate relationships between the coordinate branches of the federal government. Marshall understood that if the Court ordered Madison to deliver the commission to Marbury, the Jefferson administration might ignore the order and tarnish the Court's reputation by exposing it as an impotent institution. On the other hand, if the Court ruled in favor of Madison, Marbury and the Federalists who had appointed and confirmed him would suffer a humiliating defeat. In either instance, the executive branch would be perceived as preeminent. The chief justice's solution to this dilemma was what one constitutional scholar has called a "masterwork of indirection, a brilliant example of Marshall's capacity to sidestep danger while seeming to court it, to advance in one direction while his opponents are looking in another" (McCloskey 1960, 40). Marshall's opinion in Marbury denied a Lilliputian power to the Supreme Court with one hand, while grabbing a titanic power for the judicial branch with the other. By rejecting Marbury's claim on the ground that the Supreme Court did not have original jurisdiction to issue the writ of mandamus under the Constitution, Marshall established the power of judicial review in the nation's highest court. While appeasing the Jeffersonian Republicans with a victory over President Adams in the battle over the president's midnight appointments, Marshall introduced the idea that the federal Constitution is the fundamental law underlying both the state and federal governments. In striking down a section of the Federalist-supported Judiciary Act, Marshall identified the Supreme Court as the authoritative interpreter of the Constitution. Each of these accomplishments set the stage for a gradual accretion of power, respect, and prestige in the federal judiciary. As the power of the federal judiciary increased, so did the power of the entire federal government, something that proved important in President Abraham Lincoln's efforts to preserve the Union during the Civil War. Curtis, Michael Kent. 2003. "Judicial Review and Populism." Wake Forest Law Review 38 (summer): 313–74. Levy, Leonard W. 1988. Original Intent and the Framers' Constitution. New York: Macmillan. McCloskey, Robert G. 1960. The American Supreme Court. Chicago: University of Chicago Press. Nelson, William E. 2000. Marbury v. Madison: The Origins and Legacy of Judicial Review. Lawrence: Univ. Press of Kansas. Randolph, Ryan. 2004. Marbury v. Madison: The New Supreme Court Gets More Power. New York: Rosen Pub. Group. Stites, Frances. N. 1997. John Marshall: Defender of the Constitution. Reading, Mass. : Addison-Wesley. Wellington, Harry H. 1991. Interpreting the Constitution: The Supreme Court and the Process of Adjudication. New Haven, Conn.: Yale. Wills, Mary, ed. 1982. The Federalist Papers, by Alexander Hamilton, James Madison and John Jay. No. 78. New York: Bantam Books. Wolfe, Christopher. 1990. Judicial Activism: Bulwark of Freedom or Precarious Security. San Diego, Calif.: Harcourt. Congress of the United States; Constitution of the United States; Judicial Review; "Marbury v. Madison" (Appendix, Primary Document); Separation of Powers; Supreme Court of the United States. at 824 ("A prominent objection to the Chevron framework is that it entails judicial abdication of the responsibility to interpret the law, a responsibility famously asserted by Chief Justice Marshall's opinion in Marbury v.
Es por ello que, mas alla de opiniones sostenidas por sus criticos, (3) Marbury v.
Writing to George Hay in 1807, Jefferson ruminated, "I have long wished for a proper occasion to have the gratuitous opinion in Marbury v.
In planning my contribution to the Van Alstyne celebration, I knew I wanted to do something challenging, but I was unsure whether to discuss Professor William Van Alstyne's significant contributions to First Amendment analysis, his terrific articles on Marbury v.
Gore (6) is only one manifestation of this concern; even more revealing (and less politically charged) is the ambivalence regarding Marbury v.
The myth, presented as standard history both in junior high civics texts and in advanced law school courses on constitutional law, runs something like this: A long, long time ago--1803, if the storyteller is trying to be precise--in the famous case of Marbury v.
For many long years, conventional wisdom had it that Marbury v.
On February 24, 1803, he made a decision in the case of Marbury v.
Authored by Chief Justice John Marshall, Marbury v.
The legacy of these formative years and the imbedded principles set forth in Marbury v.
Marshall's principal claim to fame as Chief Justice--though by no means his only one--is his authoring the Court's opinion in the famous case of Marbury v.
John Marshall's 1803 landmark decision in Marbury v.